I decided to sketch at sites along the Prime Meridien in London - but didn't plan on having a puncture which curtailed activities pdq. I got one sketch done though - sitting on the top of the hill in Greenwich Hill - looking down the meridien to what was the Dome and is now the O2 Arena. Wow, it's so warm and kinda fluffy, I wish I could roll myself all over in that picture. Still can clearly reckognize the Dome in the background. Great. I tried doing some of your colored-pencil hatching this morning at sunrise -- definitely lots to learn but it's very interesting. Any tips? I've got a whole page on my website dedicated to advice about sketching - and some of this is about coloured pencils - but I think I've still to do the definitive blog post about hatching! The main thing is to keep the hatching open so you can layer different colours and create some optical colour mixing (eg use blues and yellows rather than greens). Katherine -- a post on hatching would be excellent (in your copious free time). I looked quickly for the page you mentioned, was it on Making a Mark or Travels? THANK YOU! This looks wonderful. I'm printing out now to read over lunch. seems like my town sapporo hahaha! anyway thanks for the share! 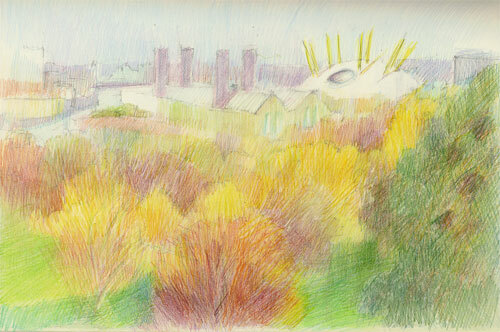 wow, Katherine, I'd never imagined London to be that colourful - great sketch ! What beautiful foliage! Looks like you had a prime sketching spot!